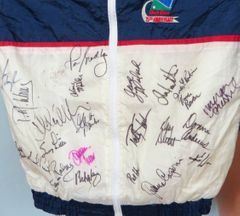 1996 LPGA Kraft Nabisco Championship 25th Anniversary 100% nylon jacket autographed on the white lower section by 24 winners of this major tournament: Amy Alcott, Pat Bradley, Pat Hurst, Jane Blalock, Brittany Lincicome, Sally Little, Lorena Ochoa (moderately faded signature), Morgan Pressel, Annika Sorenstam (rare full name signature), Judy Rankin, Patricia Meunier-Lebouc, Sandra Palmer, Grace Park, Nanci Bowen, Alice Miller, Donna Caponi, Dottie Pepper (violet signature; slightly faded), Patty Sheehan, Nancy Lopez (dated 2003; slightly faded signature), Juli Inkster, Helen Alfredsson, Karrie Webb, Betsy King and Donna Andrews. Obtained in person at the LPGA Kraft Nabisco Championship tournament over multiple years. With certificate of authenticity from AutographsForSale.com. Has very minor age discoloration. ONLY ONE AVAILABLE FOR SALE.